I was looking at all the people which were/are using Mailbox and were looking for an alternatives (because they shutdown next month) and thought that it would be good to see a comparison of alternative e-mails apps. I wasn’t using Mailbox myself but was looking a few months ago for alternatives for the standard Mail app especially because of the way it handles attachments but also other things. 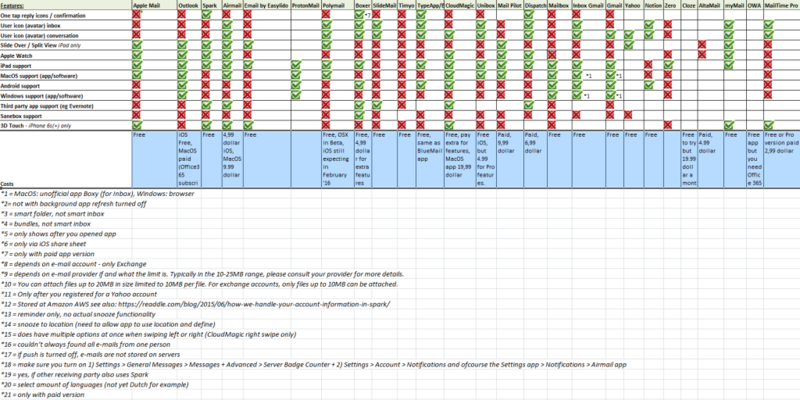 Here is a part of an offline Excel sheet I created to compare almost all apps. You can download a copy here. See a better image here and here. Still work in progress btw. To download a copy of the sheet press here (I will get a notification if you want to access and will approve ASAP)..
1) A critical blog about Readdle’s Spark here. 2) A critical blog about Microsoft Outlook app has serious security risks for Business use. 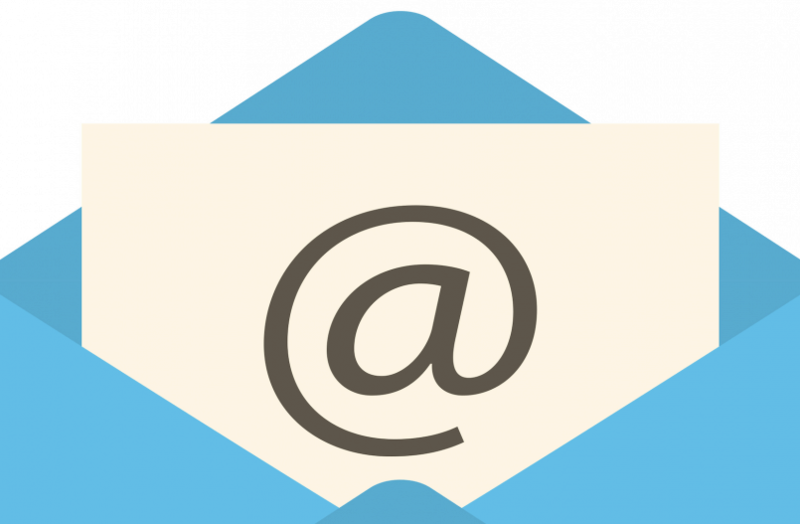 3) A critical blog about Blue Mail / TypeApp regarding the use of AWS storage/usage. 4) A critical forum post about privacy/security in e-mail apps. Email by Easylido (free) – attachments one by one, shows attachments above message, reminders/snooze, swipe gestures (customizable), landscape support, smart/unified inbox, no language support, no Apple Watch support, support badge app icon (inbox zero), has 3D Touch, no calendar support, no quick reply, iPad support, Slide Over/Split View iPad (multitasking), can’t search in e-mails older then 3 months. Nice overview of features of various app can be found in this review. Note: You can attach files up to 20MB in size limited to 10MB per file (at least with Spark, CloudMagic that is the case with the majority of cloud storage (e.g. Dropbox) of which you grab the files. I posted this overview earlier on the MacRumors forum, see here. 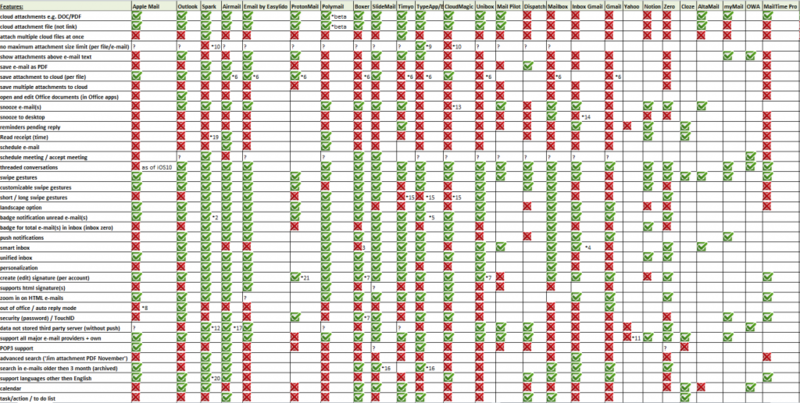 I have created a complete Excel sheet overview will all features you can think off. For requests contact me via @pacorob on Twitter.